Today’s stamps from Greenland are called pole to pole and are a part of the joint issue with New Zealand post. The title “pole to pole” refers to the Arctic and Antarctic poles. The souvenir stamp sheet displays a polar bear at the North Pole and a special type of penguin named the Chinstrap penguin in the South Pole. Greenland, the second largest continent after Australia represents the Arctic pole in the picture and the Ross dependency, a New Zealand claimed region in Antarctica is seen at the South Pole. 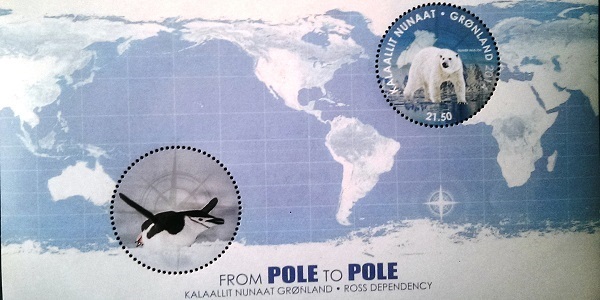 New Zealand issues special edition of stamps to be used for letters sent from the Ross Dependency region. It is interesting to know that even in such extreme weather conditions, humans not only inhabit these parts of land but are also connected through postal services. Would you like to become a participant in our postal surveys and receive letters from all around the world with beautiful stamps like these? Then please do not hesitate to register on our website www.world-mail-panel.com (GMS 1107) or email us at panel@quotas.de.